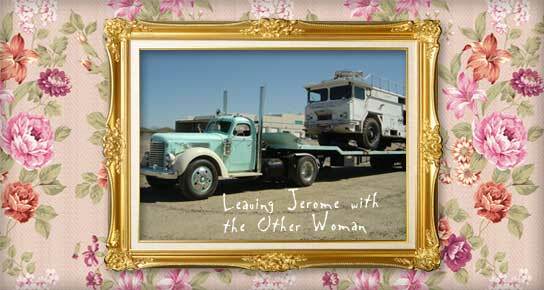 Walter began life much like anyone else – in 1963 as a rescue vehicle at an airport. 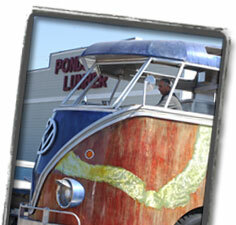 Originally, he is a Walter Crash Truck that was stationed at Luke Air Force Base – hence the moniker, Walter. Luke Air Force Base has been in Arizona since the 1940’s and they’ve trained pilots for every major conflict since WWII. Walter’s job there was explicit – sit and wait for a plane to crash. Tense work, as you may imagine. At airports, crash trucks are the first emergency vehicles to respond with their high powered water cannons that spray flame retarding foam to extinguish the highly volatile airplane fuel. He still proudly bears a plaque on his engine commemorating his time at Luke. From there Walter moved on to the New River fire department where he spent his time in the continuing effort of saving lives. There weren’t as many Dalmatians as you’d think and, after a few years helping out the good folks of New River, he came into the capable care of a wonderful man by the name of Don who took him up to Jerome, AZ. Don and Walter chilled at the Gold King Mine for many years and Walter did a whole lot of nothing-much-at-all, a welcome break after many intense years. 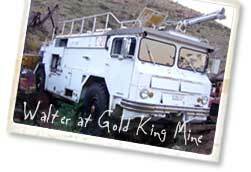 For five years Walter sat at Gold King Mine just soaking up the cool mountain air and relaxed vibes, which included the annual Jerome Jamboree where hundreds of vintage VW buses climb the mountain to camp in the mine. In 2003, an issue of Hot VWs Magazine rolled off the presses and had a butterfly effect that would change his life in ways unimaginable. Inside that magazine was an article about the Burning Man festival. This article fell in front of one Kirk Strawn – the future benefactor of the world’s largest VW project – who would soon after attend the Jerome Jamboree. During the next seven years, Kirk involved himself with a progressively expanding tribe of people as crazy as he is (check them out on the Tribe Walter page). As Tribe Walter applied their mechanical skill, artistic passion, architectural savvy, lighting dynamics, and fabricator aplomb, Walter became styled into a 2:1 scale VW bus. Yet, like most creative passions realized, they meant for Walter to become grander – something more like a juggernaut-sized celebration of the will to dream and create, to do something unique…simply to do it. 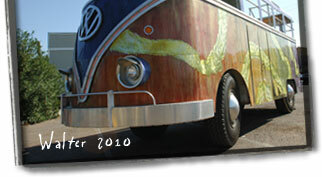 After so many years of planning and creating, the Tribe and Walter attended Burning Man together in 2009. The experience was beyond memorable and will definitely become a repeat pilgrimage. Now, we see many adventures ahead. “What type” you ponder and plead? Well, lots of attendance at VW events around the country and world, educational programs, partying with those who want Walter (check out the booking page), a mobile brewery… If you have some ideas of how Walter could spread the creative energy, get in touch – we’re always looking for a unique party and event to enjoy with new friends. Walter’s website is a permanent presence and will grow over time to include new pages about new additions to his repertoire, so check back often. Don’t forget to read the Scribbles blog as we’ll be posting all sorts of random news there from time-to-time. We’ll also be chatting with friends at Walter’s Facebook page and posting photos over on our Flickr page. As the tribe would more prosaically tell, Walter’s mission has come full circle – he has always been about saving lives, but now he saves them from boredom. Help us out, won’t you?